It’s fantastic to learn that this term we are teaming up with the children from Nutfield Church Primary School as they aim to support different charities every term as part of a series of ‘Love Projects’. The theme fits very well into our charity vision of supporting the community with love. The school council and faith team contacted Loveworks as they wanted to do something to support our food poverty project and following a school assembly delivered by the Loveworks volunteer schools liaison officer, Mr Graham Humphries, the children decided to run ‘A Tin a Week’ project this term. 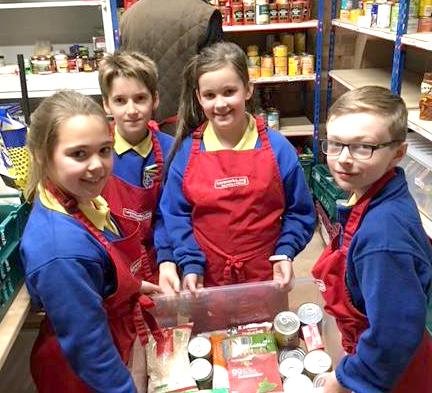 In addition to collecting food for the Loveworks food bank, the children saw behind the scenes at the food bank store and even took part in weighing some food donations before visiting the new community hub in Merstham where people come to get help and receive their emergency food pack. The school will also be undertaking a sponsored run challenge at some point to raise funds for Loveworks. Many families locally are struggling to make ends meet and feed their families and the school have pledged to help encourage their parent body to seek help if they are in food crisis and have agreed to act as a charity partner to Loveworks and can issue food bank vouchers to individuals and families when in emergency food crisis.